Gary Neville enjoyed a third successive win as Valencia's revival continued with a fortunate 2-1 victory over La Liga strugglers Granada. 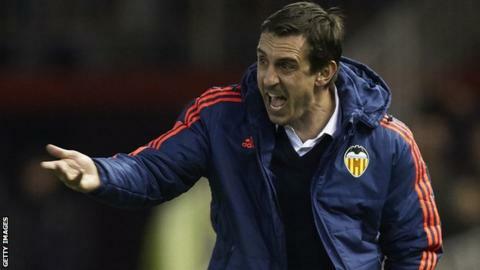 After a first league win last weekend, Neville's side won away in La Liga for the first time since November. Daniel Parejo, who scored in Valencia's 6-0 midweek Europa League win over Rapid Vienna, got the opening goal. Santiago Mina then made it 2-0 on the break in the last minute before Edgar Mendez headed one back in injury time. Andre Gomes twice went close to giving Valencia a first-half lead but both times he was denied by fine saves from Andres Fernandez. The visitors finally went in front 10 minutes into the second half when Paco Alcacer laid the ball off for Parejo to stroke home his eighth goal of the season. But Valencia, who moved up to 11th in the table, then rode their luck as David Barral hit the bar from a couple of yards out and substitute Youssef El-Arabi headed wide. Former England and Manchester United full-back Neville must have been alarmed at his side's defending before Mendez tapped in their second goal, after Fernandez had saved Alcacer's attempted chip. Mendez still had time to head in from a free-kick but could not prevent bottom club Granada slumping to a sixth defeat in their last seven games. Elsewhere, Rayo Vallecano edged away from the relegation places with a point from a 2-2 draw with fifth-placed Seville. Real Sociedad won 1-0 at Athletic Bilbao to secure a fourth successive league victory. Match ends, Granada CF 1, Valencia 2. Second Half ends, Granada CF 1, Valencia 2. Pablo Piatti (Valencia) wins a free kick on the left wing. Goal! Granada CF 1, Valencia 2. Edgar Méndez (Granada CF) header from very close range to the bottom right corner. Assisted by Rubén Rochina with a cross following a set piece situation. Success (Granada CF) wins a free kick on the left wing. Foul by André Gomes (Valencia). Goal! Granada CF 0, Valencia 2. Santi Mina (Valencia) right footed shot from the centre of the box to the bottom left corner. Attempt saved. Paco Alcácer (Valencia) right footed shot from the centre of the box is saved in the centre of the goal. Pablo Piatti (Valencia) wins a free kick in the defensive half. Attempt missed. Dimitri Foulquier (Granada CF) right footed shot from outside the box is close, but misses the top right corner following a corner. Corner, Granada CF. Conceded by Aderlan Santos. Attempt blocked. Youssef El-Arabi (Granada CF) right footed shot from outside the box is blocked. Success (Granada CF) is shown the yellow card. Diego Alves (Valencia) is shown the yellow card. Substitution, Valencia. Antonio Barragán replaces Guilherme Siqueira. Attempt blocked. Success (Granada CF) right footed shot from the centre of the box is blocked. Assisted by Youssef El-Arabi. Substitution, Valencia. Santi Mina replaces Sofiane Feghouli. Attempt missed. Youssef El-Arabi (Granada CF) left footed shot from the centre of the box misses to the left. Assisted by Success with a cross. Foul by Isaac Cuenca (Granada CF). André Gomes (Valencia) wins a free kick in the defensive half. Attempt missed. Paco Alcácer (Valencia) right footed shot from outside the box is too high. Assisted by Daniel Parejo. Isaac Cuenca (Granada CF) wins a free kick in the defensive half. Attempt missed. Youssef El-Arabi (Granada CF) header from the centre of the box is close, but misses to the left. Assisted by Miguel Lopes with a cross. Substitution, Granada CF. Isaac Cuenca replaces Rubén Pérez. Substitution, Valencia. Pablo Piatti replaces Denis Cheryshev. Offside, Granada CF. Rubén Rochina tries a through ball, but Edgar Méndez is caught offside.